"In this time of national mourning we have decided to forgo our scheduled event," the film's distributor said. Meanwhile, Tom Cruise is to attend a scaled-down screening of his new film Jack Reacher in Pittsburgh. Wednesday's event replaces a planned premiere on Saturday that Paramount Pictures called off "out of honour and respect for the families of the victims". There will be no red carpet at the event although Cruise will introduce the film, which opens with a sniper shooting several people dead. A Jack Reacher screening scheduled to take place at New York's Lincoln Center on Monday was also called off. Cast and crew members had been expected to attend the benefit screening, which has been postponed indefinitely. Parental Guidance, a comedy starring Billy Crystal, was another film that had its Hollywood premiere cancelled on Saturday. "The hearts of all involved with this film go out to the victims, their families, their community, and our entire nation in mourning," said the Fox studio in a statement. Episodes of US comedy series Family Guy, American Dad and The Cleveland Show were dropped on Sunday to avoid any potential insensitivities. Sunday's broadcast of Homeland was not pulled, but did begin with a statement saying the terrorist drama contained "images that may be disturbing". 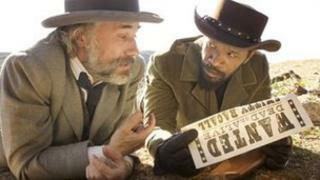 Django Unchained tells of a freed slave, played by Jamie Foxx, who becomes a bounty hunter. The film contains a large number of bloody killings. Tarantino has defended violence in movies. He said at a press junket in New York for the film on Saturday that he was tired of defending his films each time the US is shocked by gun violence. "I just think you know there's violence in the world, tragedies happen, blame the playmakers," he said, adding: "It's a western. Give me a break." Twenty children and six women died in the assault on Sandy Hook school by a lone man who then took his own life.